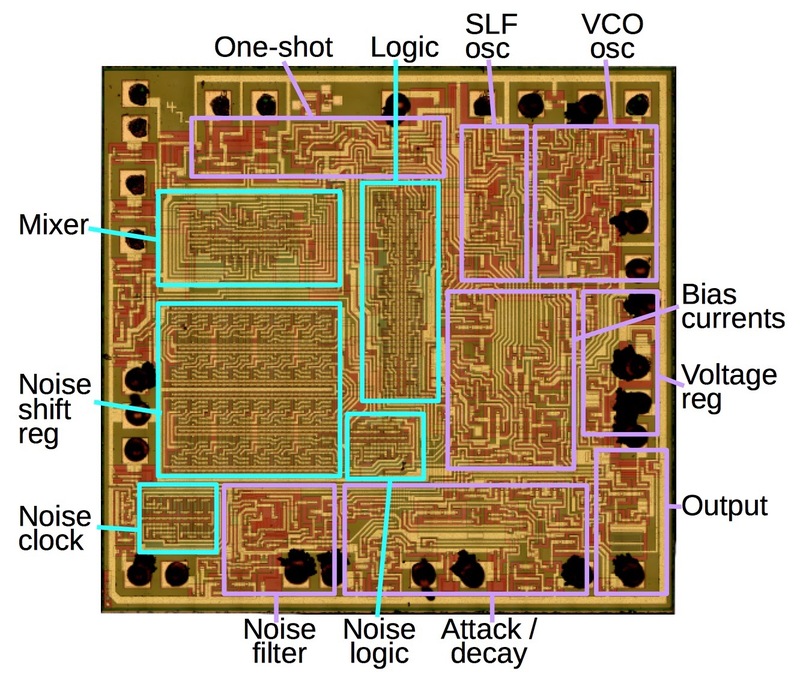 The 76477 chip combines several functional blocks to produce a variety of sound effects. A voltage-controlled oscillator (VCO) produces a signal whose frequency depends on the control voltage. A "super low frequency" SLF oscillator generates a triangle wave. Feeding this into the VCO generates a varying pitch, useful for bird chirps, sirens, or the warbling sound of the UFO in Space Invaders. A "one-shot" produces a pulse of a fixed length to control the length of the sound. An envelope generator makes the sound more realistic by ramping its amplitude (volume) up at the start and down at the end. A digital white noise generator can be used for drums, gunshots, explosions and other similar sound effects. Finally a digital mixer combines these signals and feeds them to the output amplifier. The block diagram below shows the chip's functional elements and can be compared to the die photo above. The chip is primarily controlled by resistors (red pins), capacitors (cyan pins) and voltages (violet pins). This made the chip difficult to control with a microprocessor, and more useful for hardwired sounds. Block diagram of the 76477 sound chip, from the datasheet. Resistor inputs: red, capacitor inputs: cyan, voltage inputs: violet. Two transistors as they appear on the die of the 76477, showing the Emitter, Base, and Collector. Resistors are an important component of analog circuits. 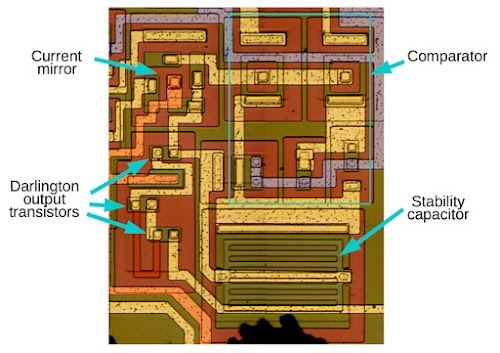 On a silicon chip, they can be formed from a long, narrow region of doped silicon with higher resistance. On an IC, resistors take a lot of space and are inaccurate, so they are generally avoided where possible. The die image below shows three resistors, which appear red in the photo. They are connected to the metal wiring at the contact points marked with blue arrows. 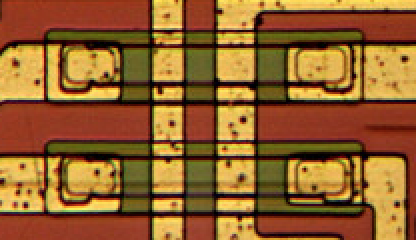 Three resistors (red) on the die of the 76477 chip. The ends of the resistors are connected to the metal layer at contact points marked in blue. If a metal wire needs to cross another metal wire, the signal can use the silicon layer to pass under the wire. Two of these cross-unders are shown below. The silicon (green) is doped to be lower resistance than in the case of a resistor. Cross-unders are higher resistance than metal wiring, so they are only used when necessary. A relatively low resistance silicon "wire" (green) passes under two metal wires. By carefully examining the die photo, you can pick out the transistors and resistors and determine how they are connected. From this, you can reverse-engineer the chip's circuits. A key component of most analog circuits is the current mirror, and the 76477 is no exception, containing many current mirrors. A current mirror takes one reference current and "clones" it, generating a current that matches the reference current. Either of the symbols below can be used to indicate a current mirror or current source. Current mirror circuit. The currents on the left copy the reference current on the right. The die segment below shows four PNP current mirror transistors providing a dozen current outputs. Each of the three pinwheel-shaped transistors has four collectors surrounding the central emitter, allowing it to produce four matched current outputs. 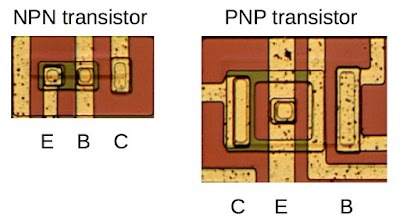 The lower left transistor is a standard PNP transistor with a ring-shaped collector. The large green rectangle in the center is the shared base connection for the transistors. Four transistors from current mirrors in the 76477 sound chip. Three of them have four collectors surrounding the emitter, giving them a "pinwheel" appearance. Another key building block of the 76477 is the comparator, comparing two voltages and determining which one is higher. The heart of the comparator is a differential pair, a two-transistor circuit. 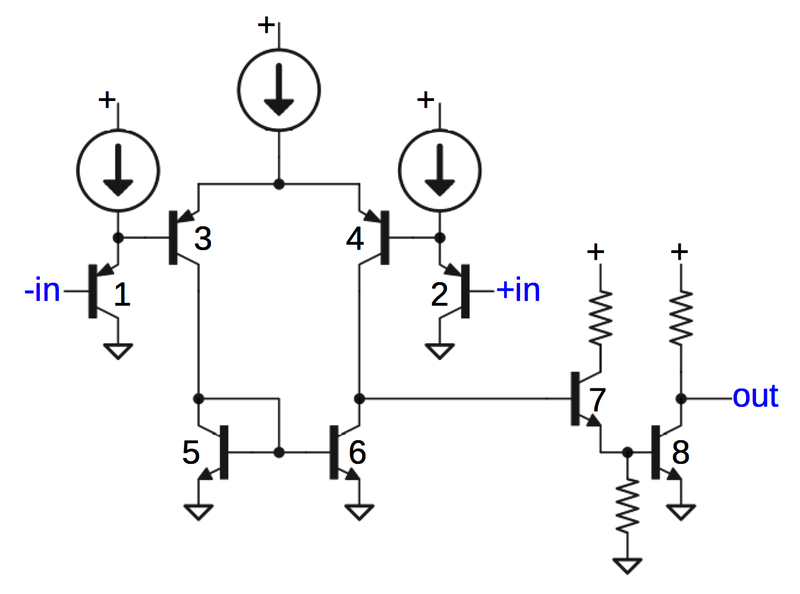 If both inputs are equal, the transistors will conduct equally and the current will be split equally along both branches. 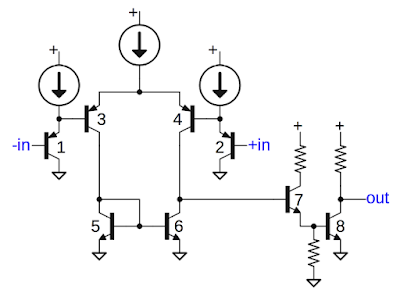 But if one input is lower, that transistor will conduct more, switching most of the current into that branch. The schematic below shows a typical comparator in the 76477. If the positive input is higher than the negative input, the comparator outputs a 1. Otherwise it outputs a 0. 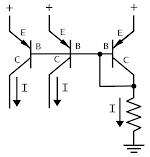 Transistors 3 and 4 form the differential pair. The current to them is supplied by a current mirror above them, and most of the current will be directed to the side with the lower input. Transistors 1 and 2 buffer the inputs (using emitter followers) and are biased by more current mirrors. Transistors 5 and 6 form another current mirror, used as an active load to double the circuit's amplification. Finally, transistors 7 and 8 form an inverter, generating a digital output from the comparator. Schematic of comparator circuit in 76477 sound chip, slightly simplified. The die image below shows one of the comparators used in the 76477 with the transistors labeled to match the schematic above. Note that transistors pairs 1 and 2, 3 and 4, and 5 and 6 have similar layouts to give them matched characteristics, improving the balance of the comparator. 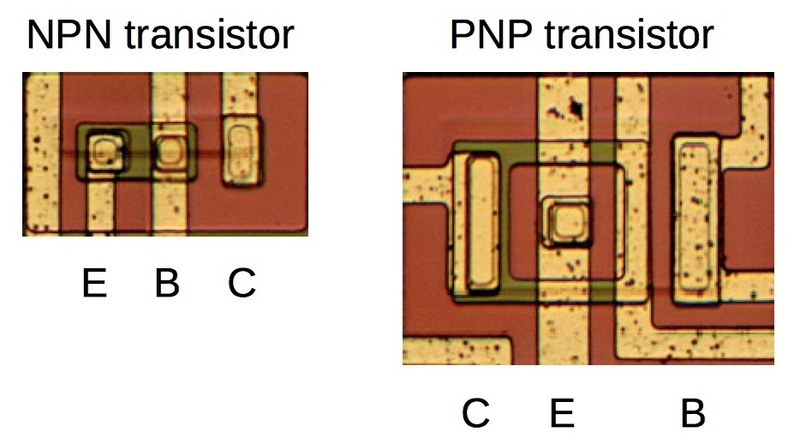 The base and collector of transistor 5 are connected together for the current mirror. 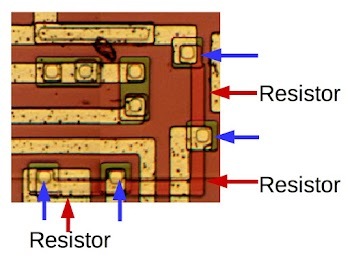 The current sources and resistors are on another part of the die, not shown below. Die image of the 76477 sound chip showing a comparator used in the one-shot circuit. The one-shot is a simple circuit that generates one pulse of a set width , triggered when the chip's inhibit signal drops low. This pulse controls the duration of the sound. For instance, a short pulse of noise can be used for a gunshot sound, while a longer noise could be an explosion. Schematic of one-shot circuit inside the 76477 sound chip. The one-shot charges an external capacitor via an external resistor and current mirror. 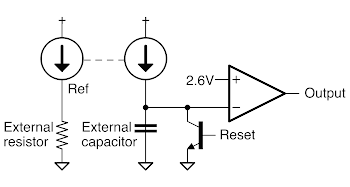 The resistor sets the reference current for the current mirror, and the mirror feeds this current into the capacitor. The advantage of using this charging circuit rather than a simple R-C circuit is that the charging current remains constant, rather than decreasing as the capacitor charges.7 This "charging trick" is used several times in the 76477. When the capacitor's voltage reaches the comparator's limit level (2.6V), the comparator output goes low and the pulse ends. Thus, the faster the capacitor charges, the shorter the pulse. Digital logic circuitry (not shown) resets the one-shot by discharging the capacitor at the end of the pulse and holds it low until the next pulse is triggered via the inhibit pin. The next functional block of the 76477 that I'll examine is the super-low frequency (SLF) oscillator. It generates a triangle wave that can control the voltage-controlled oscillator (VCO) to generate warbling sounds by ramping the pitch up and down. The frequency is controlled by an external resistor and an external capacitor. Like the one-shot, a current mirror provides a fixed charging current. However, the SLF oscillator uses a second current mirror to discharge the capacitor at the same rate, generating the triangle wave output. Building a current mirror from NPN transistors creates a current mirror that sinks current instead of sourcing current, as in the lower current mirror. This current mirror also uses another trick: by using a transistor with two emitters, the current mirror doubles the output current; this is indicated on the schematic with two arrows in the current mirror circle. When the lower current mirror is disabled by the transistor, the capacitor is charged by the upper current mirror, with a current (I) set by the resistor, similar to the one-shot circuit. But with the lower current mirror enabled, the lower current mirror sinks current 2I. Since the upper current mirror is still supplying I to the capacitor, the net current (-I) discharges the capacitor. Thus, by combining two current mirrors, the capacitor can either be charged or discharged with the same current I. This trick will appear again in the VCO. 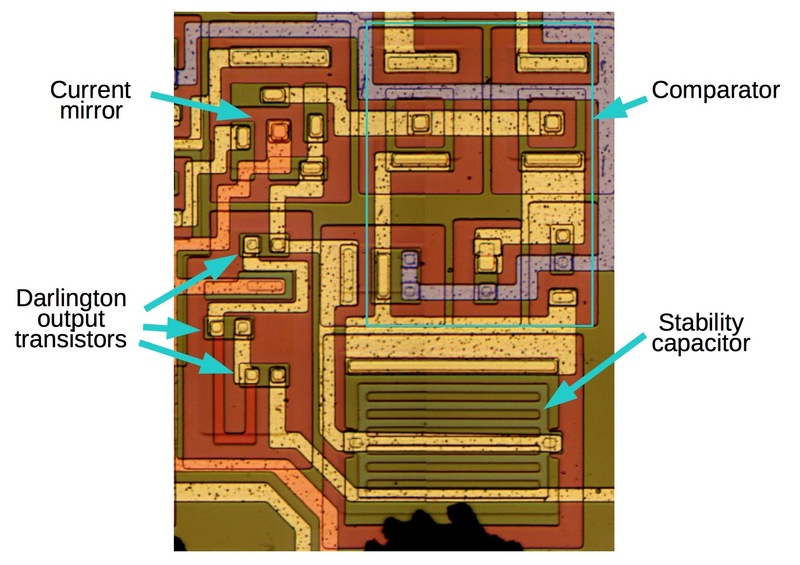 Schematic of SLF inside the 76477 sound chip. The final piece of the SLF oscillator is the comparator. The + input is set to an upper limit of 2.46 volts, so the comparator will output 1 as the capacitor charges. When the capacitor reaches the limit voltage, the comparator output drops to 0. The first effect of this is to enable the lower mirror, so the capacitor starts discharging. The second effect is to pull the comparator input low (0.36V) through the hysteresis circuit.6 This keeps the comparator output low until the capacitor has discharged. Thus the circuit "remembers" if it is charging or discharging, without using a flip flop. The square wave output is used by the mixer and the triangle wave output is used by the VCO. 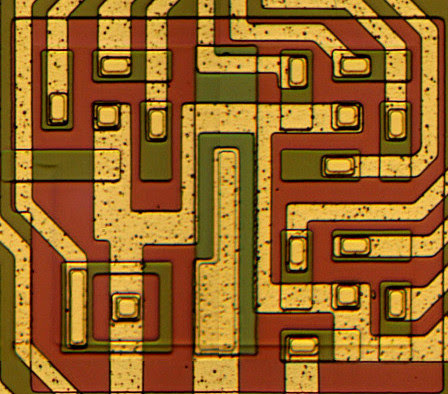 Zooming in on the die of the 76477 sound chip shows the circuitry for the SLF oscillator. 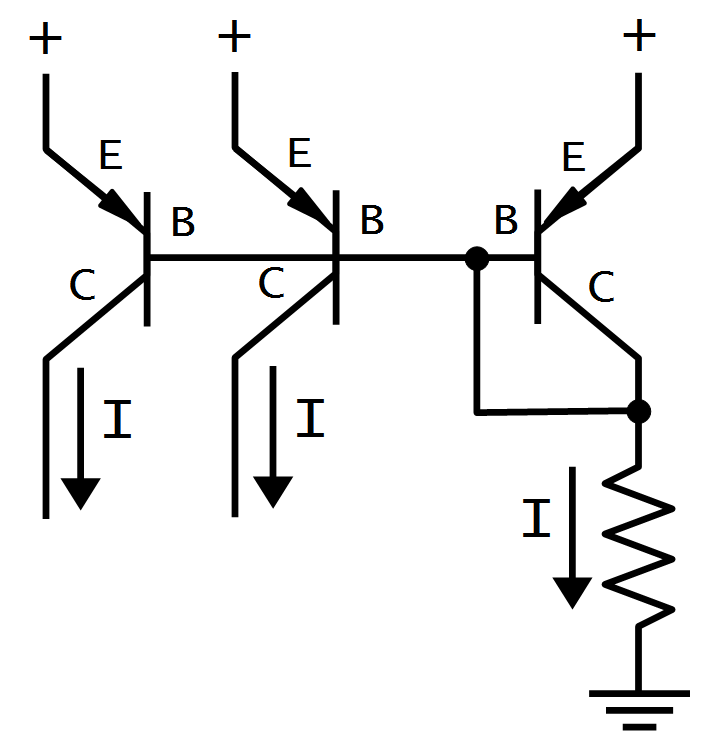 The diagram above shows how the SLF circuit looks on the die. Note the three transistors for the upper current mirror. Below the capacitor pin is a transistor for the lower current mirror with a doubled emitter; this causes the mirror's output current to be doubled. On the left are resistors forming the hysteresis circuit. The comparator circuit is underneath it. The Vcc power trace has been colored red and the ground trace has been colored blue. The voltage-controlled oscillator generates a pitch that depends on its voltage input, as shown below. 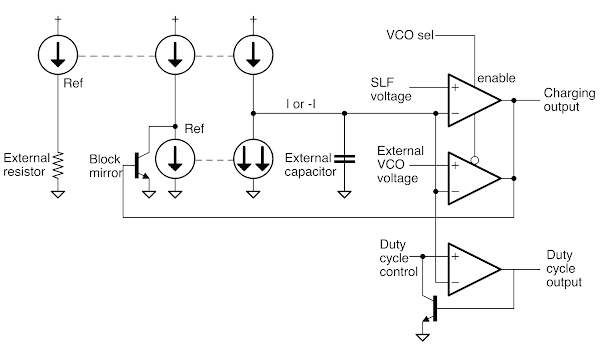 The circuit for the VCO has a lot in common with the SLF: it creates a triangle wave by charging and discharging an external capacitor. The main difference is that it charges until the capacitor reaches the control voltage (rather than a fixed voltage). Thus, the voltage input controls the pitch: with a higher control voltage, the capacitor takes longer to charge so the frequency is lower. This control voltage can be provided either from the SLF or an external pin. The "VCO select" pin selects which control voltage to use. The triangle wave from the SLF oscillator can control the frequency of the Voltage Controlled Oscillator (VCO). From the 76477 datasheet. The VCO's output is a digital square wave that is active during the charging half of the VCO's internal triangle wave. Another pin controls the output's duty cycle, the fraction of the time it is high.8 The triangle wave is compared to the duty cycle control voltage to determine when the output switches on and off. A lower control voltage results in a shorter duty cycle while a higher control voltage results in a longer duty cycle (up to 50%). The digital logic combines the two outputs to yield the final output. The VCO has two comparators in parallel; the VCO select input enables one of them. 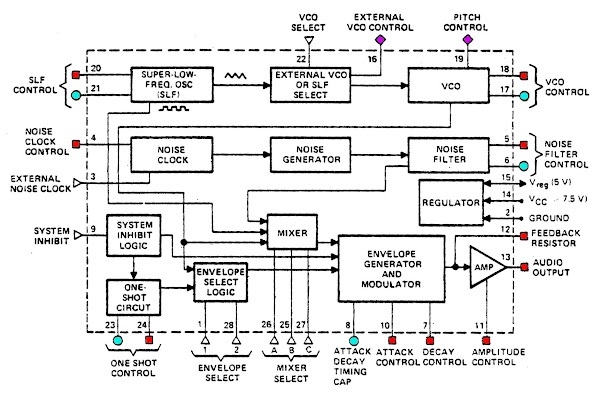 Schematic of VCO inside the 76477 sound chip. A sound waveform with attack and decay applied. The schematic below shows the circuit for envelope generation. As with the other circuits, a capacitor is charged and discharged using current mirrors, but two separate resistors are used so the charge (attack) and discharge (decay) rates can be different. The attack signal (from the digital logic) causes the envelope capacitor to charge through a current mirror at a rate controlled by an external attack resistor. The decay signal (simply the complement of the attack signal) causes the capacitor to discharge, controlled by the external decay resistor. Discharge uses a second current mirror operating as a current sink, but unlike earlier circuits it doesn't double the current. 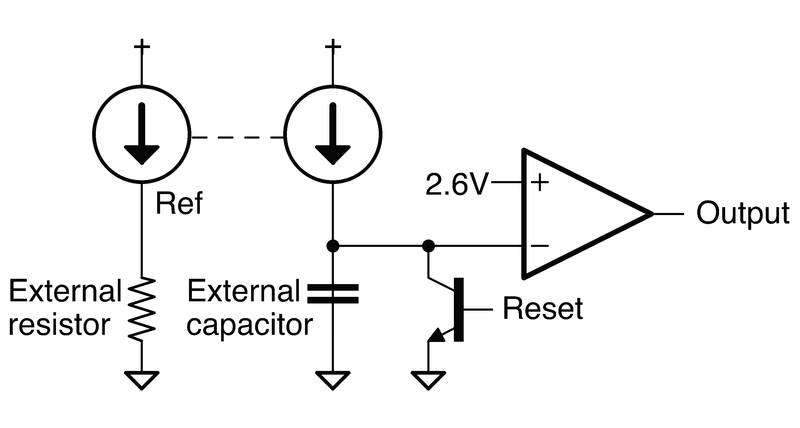 The inhibit signal rapidly discharges the capacitor, resetting the envelope. Schematic of envelope generator inside the 76477 sound chip. The 76477's output circuit uses four separate current mirrors. The varying reference current for the first current mirror is generated from the envelope voltage and the external amplitude resistor. Unlike the other control resistors, this resistor has a varying voltage applied so it produces a varying reference current. This current controls the output's overall amplitude. Schematic of output circuit inside the 76477 sound chip. The amplitude reference current goes into the second current mirror (lower left). 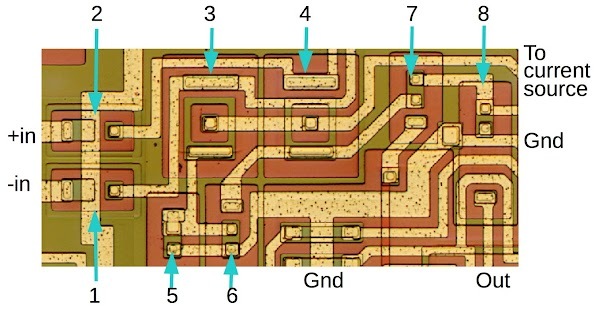 The inhibit signal blocks this current mirror, which is how the inhibit signal blocks the chip's output. A third current mirror (upper right) generates two output currents referenced from the current sunk by the second current mirror. The final current mirror is enabled and disabled by the output signal from the mixer. Thus, the current to the op amp alternates between positive and negative, with magnitude depending on the envelope and the control resistor. The output op amp drives triple-Darlington emitter-follower output transistors. These transistors are not particularly large, so the 76477 has limited output power. An external feedback resistor to the op amp controls the output's amplification. The die photo below shows part of the output circuit. A capacitor helps stabilize the output so it doesn't oscillate. Part of the output circuit for the 76477 sound chip. 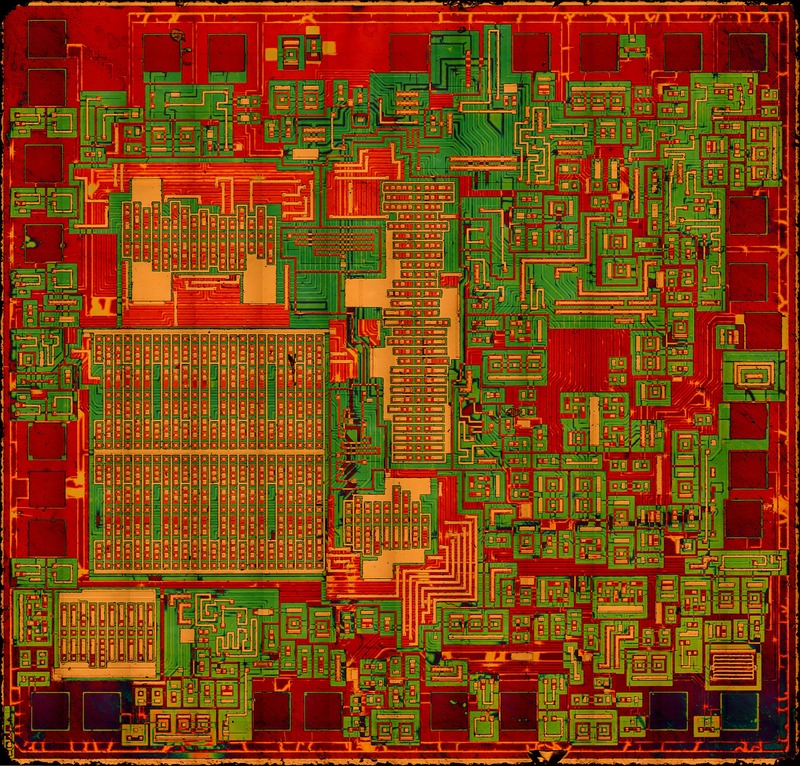 The 76477 is a complex integrated circuit with hundreds of transistors, but by examining the die the operation of the chip can be reverse engineered. The chip uses interesting techniques to generate sounds by combining oscillators, a noise generator and other functional blocks. 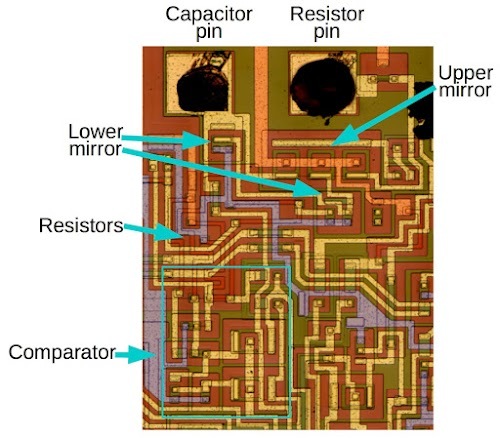 Outside of analog chips, current mirrors are fairly obscure but the 76477 makes heavy use of current mirrors, with multiple current mirrors in almost every functional unit, driving comparators, generating bias currents, and providing uniform charge/discharge currents. The chip had several disadvantages that led to its replacement by more advanced chips. The biggest inconvenience is that most of the 76477's parameters are controlled by resistors and capacitors, rather than digitally, making it hard to control the chip with a microprocessor. A second disadvantage of the chip is the sounds were largely digital square waves which gave the sounds a harsh quality rather than a "warm" analog sound. 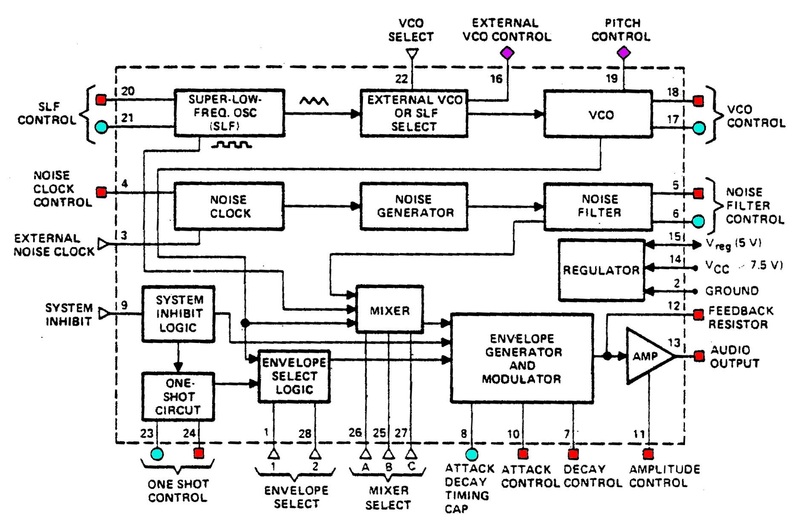 Finally, it was difficult to produce accurate pitches with the VCO, making the chip less useful for music synthesis. For these reasons, digitally-controlled chips such as the AY-3-8910 (1978) surpassed the 76477 in popularity. Thanks to Sean Riddle for the die photos. I'll end with his die photo of the 76477 after dissolving the metal layer in acid, making it easier to see the resistors and transistors. 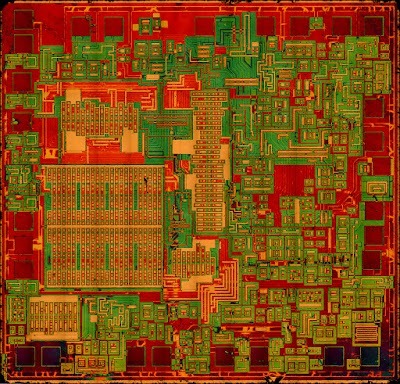 Die photo of the 76477 sound chip. The metal layer has been dissolved with acid to reveal the silicon. Colors are enhanced. Photo courtesy of Sean Riddle. I have always wondered how retro sound chips worked, and this article was a great look into how a very basic one functioned. The sound was one of the most important features of space invaders. It was one of the first video games to have constant background music, uninterrupted by other sound effects. The four-note tune is unbelievably simple, but will evoke nostalgia from anyone who has played it. The sound was also dynamic, increasing in tempo as the game got faster and faster. The game also used sounds to announce the presence of UFOs, and made an unique sound upon destroying them. Try playing the game without any sound and you realize how integral it was in gameplay. One more interesting fact about space invaders is that the 8080A chip that powered it could barely handle all of the aliens. As more aliens died, the game would move faster and faster. Instead of fixing this, the designers kept it as a gameplay mechanic. Keep up the work on part 2, I would also love articles on the 8080 (You've done some on the 8008 and the 8085 but not the one between) and the General Instruments AY-3-8500. The sound chip was used in the Swedish made computer ABC 80. A Zilog Z80 based computer running Basic that was widely used in schools and industry. The SN76477 was accessed by a OUT command that took an 8 bit argument to control waveform, mixer and envelope. Not sure if it works but nice to know what's inside! Great article! I've been a fan of the 76477 for some time, I actually wrote a simulator for it for the iPad and iPhone, Synth 76477. Ask anyone that played this game a lot, it makes the back of your hands hurt from pushing the buttons too hard. I thought I was an expert, in about 1980 I was in a pizza place, a 10 year old kid taught me all the hidden secrets of Space Invaders. Like shooting all the aliens in the back first. I cut my teeth messing about with the 76477 back in 1980 when I brought one home in a blister pack from Radio Shack. I had a lot of fun with that chip - it actually ended up in my college senior project eight years later! Thank you Ken, amazing as always! The related SN76489 was used in the BBC Model B micro computer. It gave the machine its distinctive "brrr... DIT" sound at power on as the machine initialized/reset the sound generator chip. The sound was one of the most important features of space invaders. It was one of the first video games to have constant background music, uninterrupted by other sound effects. The four-note tune is unbelievably simple but will evoke nostalgia from anyone who has played it. The sound was also dynamic, increasing in tempo as the game got faster and faster. The game also used sounds to announce the presence of UFOs and made a unique sound upon destroying them. Try playing the game without any sound and you realize how integral it was in gameplay. Great article! Small correction in the 'Comparators' section: "The emitter and collector of transistor 5 are connected together for the current mirror." Of course, it's the base and collector that are connected together.